Here’s an addition to my coffee shop conquest: Figaro! Thanks to Starmall Las Pinas, I’ve finally had a taste of this Filipino coffee company, something new to the usual foreign originating coffee houses in the Philippines. What does Figaro mean? In French, it’s literally translated to the word “barber” but the word is more popularly associated with the plays Le Barbier de Séville, The Marriage of Figaro, and The Guilty Mother by Pierre de Beaumarchais. Locally, it’s a coffee company Filipinos should be proud of. Figaro had already branched out overseas including China and Malaysia. They serve hot and cold coffee drinks, herbal blends, tea, shakes, cakes, pasta, and more. And you will love each serving of foreign drinks and dishes with a touch of Filipino taste. 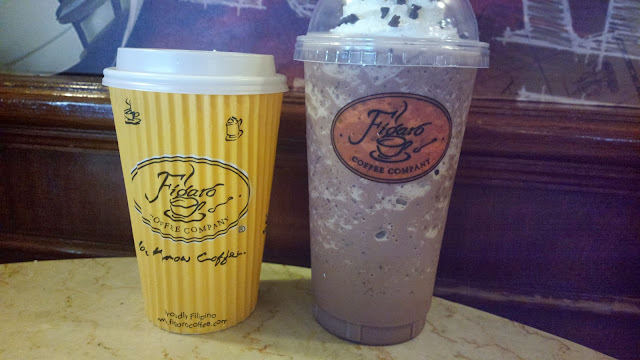 For more information including locations, franchising, careers, and more, visit www.figarocoffee.com.